The 12 speakers who will take part in TEDxUCD 2017 were announced today at University College Dublin (UCD). This will be the fifth annual TEDx event held at the University and it is being organised by volunteers from UCD Research and Innovation. Over the last 4-years a total of 40 speakers have delivered a TEDxUCD talk and these talks combined have now received over 385,000 views on YouTube. TEDxUCD 2017 will feature exceptional talks from members of the wider UCD community including researchers, students, alumni and friends who will speak on a wide range of ideas worth spreading. The event takes place on Tuesday, 5 December, (10 am – 4 pm), in the UCD Dramsoc Theatre, UCD Student Centre. The 100 free tickets to attend TEDxUCD 2017 will go on ‘sale’ on Wednesday, 22 November at 1:30 pm via https://www.eventbrite.ie/e/tedxucd-2017-tickets-39225749272. 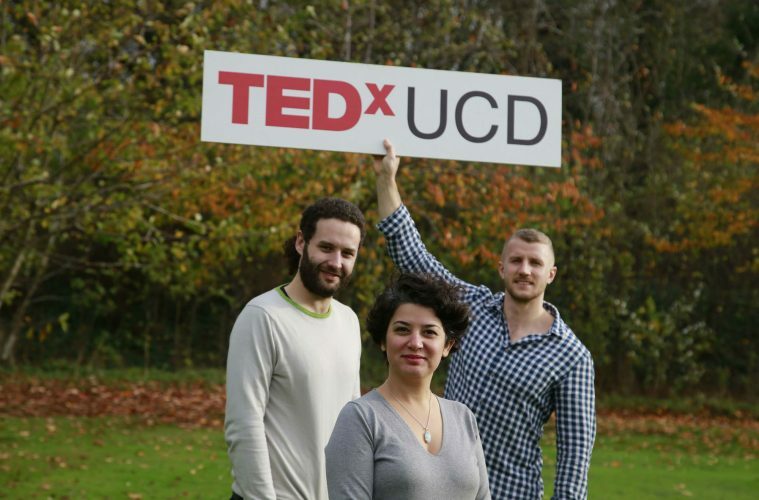 Among this year’s TEDxUCD speakers are; Dr Bahareh Heravi, Colin Keogh and Dominic O’Connor. At TEDxUCD 2017 a combination of live speakers and a selection of TED Talks videos will be combined to spark deep discussion and connection in a small group of 100 attendees. The TED conference provides general guidance for the TEDx programme, but individual TEDx events, including TEDxUCD, are self-organised. Caroline Fothergill, currently a master’s marketing student at the UCD Michael Smurfit Graduate Business School, will act as MC for TEDxUCD 2017. Siobhan McDonald is a visual artist and is currently Artist in Residence at the UCD School of Biology and Environmental Science. She was previously an Artist in Residence at Parity Studios. Her TEDxUCD 2017 talk title is TBC. Dr Mark Rowe, on graduating from UCD’s School of Medicine, established his family practice at the Waterford Health Park, a space that he founded as a new paradigm for sustainable improvements in community health. His TEDxUCD 2017 talk is entitled ‘Life is a tape measure, how will you measure yours ?’.